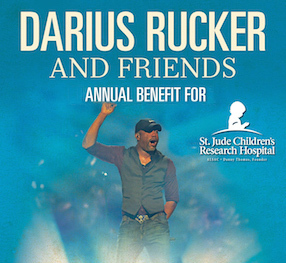 2018 Darius and Friends Benefit for St. Judes Announced! Darius and Friends is back and better than ever! The show to benefit St. Jude Children's Research Hospital will kick off CMA Fest week at the historic Ryman Auditorium on Monday, June 4, 2018 at 7:30 PM. Lineup to follow. Tickets: $50 - $100 / On Sale Friday, April 20, 2018 at 10:00 AM CT - Tickets available here.